I’ve done some gross things in my day. Being a parent, it comes with the territory. I’ve cleaned up my share of explosive diarrhea. One time my son vomited a whole meal’s worth of chili – from the top of a bunk bed. It took me 2 days to get chili out of the carpet, off the walls and in the cracks and crevices of the bed. Fun times. But nothing – NOTHING! – compared to a recent experience that I had with my dog. I was just getting out of the shower when I heard my husband yelling, “Sherrelle, come quick!” Thinking something was wrong with one of the kids, I ran downstairs in a towel where I was further summoned outside. Ditching the towel and throwing on a coat and my slippers, I go outside to see my son standing on the sidewalk holding our puppy, Chili Dawg. And in his mouth is a dead squirrel. Let’s stop for a minute and rewind. Did you notice that my husband called me outside? To take a dead squirrel out of my dog’s mouth while he watched from the porch? And this is not the first time that I was asked to handle a dead squirrel. When my dad removed a dead squirrel from our attic he handed it down to me in a trash bag, because he knows that my husband (who was standing right there) wasn’t going anywhere near it. I’m not squeamish, but even I have my limits. A dead squirrel in a trash bag is not the same as one hanging out of my dog’s mouth. Oh, let me clarify: this wasn’t just a dead squirrel (like from the attic); my dog had picked up squirrel road kill on his walk. 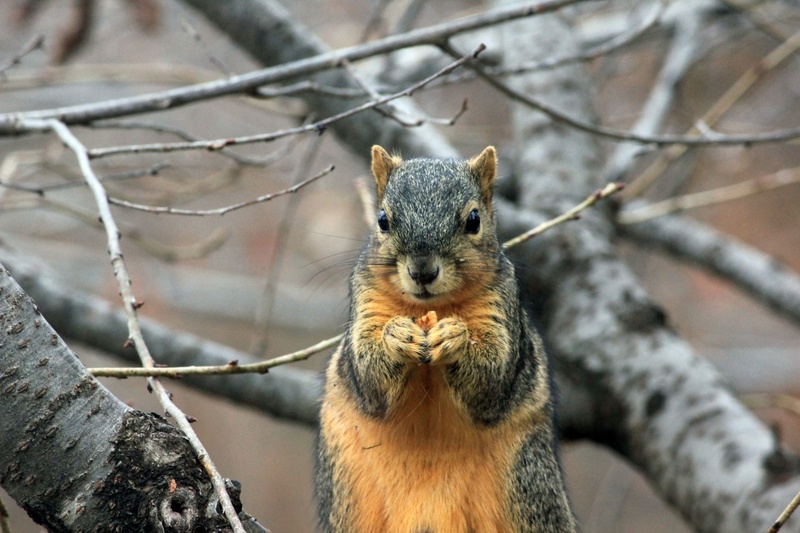 It was about 3/4 of a squirrel – minus the head – with blood and guts spilling out. Yeah. I actually tried to find photo online to accompany this story and there were many to choose from. For some disturbing reason people take photos of squirrel road kill. But I couldn’t bring myself to use a photo; my stomach turned just looking at the images. So this photo of a live squirrel is misleading, but dead or alive I don’t believe that I will ever look at a squirrel the same again. As disgusting as it was – AND IT WAS DISGUSTING – what choice did I have? My kids couldn’t do it and my husband wasn’t going to do it. 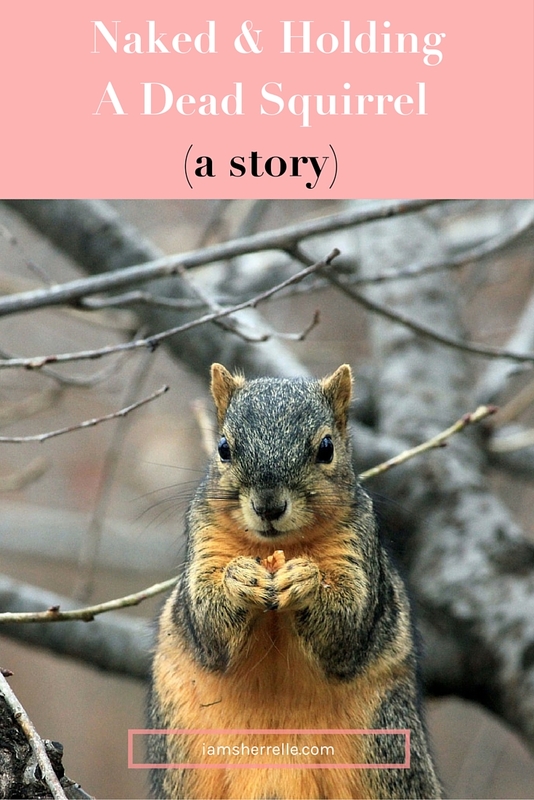 My dog’s health depended upon me removing the squirrel from his mouth – which was not going to be easy, I could tell. He had a death-grip on that squirrel and no amount of cajoling or bribing him with treats was working, so I put on rubber gloves and pried his mouth open. To do this I was very close to the dead squirrel and the smell and sight of squirrel guts was overwhelming. I dry-heaved several times in the process, but finally pried the squirrel out of Chili Dawg’s mouth and threw it on the ground. I disposed of most of the squirrel pieces before one final heave told me that I had reached my limit. My husband (watching from the porch) saw that I could go no further and finished picking up the last bit of squirrel guts from the sidewalk. I spent the next half hour sitting on the porch washing Chili Dawg’s face and brushing his teeth. Still naked under my coat. P.S. You may also like to read other stories. I dry heaved reading this because I can completely picture the entire thing. Stripes earned! That is the most disgusting thing I have ver heard. There is no way I would have let my husbad get away with making me do that. He would owe me so big, it wouldn’t even be worth it! See, what is funny about this whole story, girl, is that you did it NAKED! .-= Debbie Hudson´s last blog ..**FREE** Oreos STILL!!!! =-. I’m so happy when you share great Chili Dawg stories like this because it helps remind me why two kids is plenty and I DO NOT need to try to get a dog. Thank you for your humor! I would have been right there on the porch with James! You can come play with my dog anytime! Oh my, I remember when i ran over a squirrel by accident. I got out the car and he looked so pitiful too. He was still alive and i scooped him up and put him on the sidewalk so noone else would finish him off.I cried like I baby, I hope he lived on. .-= tami´s last blog ..Warm & Cozy with M.A.C. =-. After my incident, I don’t think that I can be that compassionate towards squirrels anymore LOL. OMG. And, your hubby called you to do this?! You are a force NOT be messed over. xo I adore you sis! .-= TheJennTaFur aka 2Serenity´s last blog .."Bush Was Responsible for Destroying Haitian Democracy" – Randall Robinson on Obama Tapping Bush to =-. My face is distorted just imagining the sight of the squirrel in Chili Dawg’s mouth. Oh the smell! I’m so sorry you had to endure that. You have officially earned your Super woman cape….if you hadn’t had it already. Ewww bless your heart …I wouldnt have succeeded in that task lol. .-= krystel´s last blog ..I Lied…I’m Back =-. You are sooooo my Shero. I don’t have the guts for that stuff and I call Mr. C for that. The gifts that my cat used to leave out front were too overwhelming. But the next time I see your hubby on CNN I’m gonna be laughing out loud the whole time. You rock! I know I’d get that job at my house too. I guess the boys figure that if we can birth babies we can lay a blood-and-guts squirrel to rest. Eww! Hat’s off to ya! Oh, James was not ashamed at all. I’m sure he thought, better you than me! And I just love Chili Dawg THAT MUCH. Although, I don’t think that I could do it again…. A stronger woman than I you are. Much stronger. .-= Darcie – Such The Spot´s last blog ..Every Rose =-.